The play "Katakiuchi Tsuzure no Nishiki" was originally written for the puppet theater (Bunraku) and staged for the first time in the 5th lunar month of 1736 in Ôsaka at the Takemotoza. It was based on a very old Kabuki drama, Fukui Yagozaemon's drama "Hinin no Adauchi" ("the Outcast's revenge"), which was staged in 1664 in Ôsaka, starring Araki Yojibê I, Kaneko Rokuemon and Nakagawa Kinnojô. The role of Shundô Jirôemon became an important vehicle for the Kamigata star Anegawa Shinshirô I, who successfully performed it in "Hinin no Adauchi" in Kyôto in 1723. "Katakiuchi Tsuzure no Nishiki" was adapted for Kabuki more than 28 years after its creation. It was premiered in Ôsaka in the 9th lunar month of 1764 at the Kado no Shibai, in a version which was revised by Namiki Jûsuke, Ichiyama Bokuhei and Namiki Ôsuke and was entitled "Oriawase Tsuzure no Nishiki" [casting]. A similar play, made under the supervision of Namiki Eisuke I, was staged one day later under a different title, "Hare Kosode Tsuzure no Nishiki", at the Naka no Shibai [casting]. The premiere at the Kado no Shibai was the 9th day of the 9th lunar month of 1764, which was the 4th of October 1764 in the western calendar. The premiere at the Naka no Shibai was the 10th day of the 9th lunar month of 1764, which was the 5th of October 1764 in the western calendar. The competition for the best performance and the best line-up was open between the 2 theaters. The performances at the Kado no Shibai were more successful than the one at the Naka no Shibai. As a consequence, the only play which remained was "Oriawase Tsuzure no Nishiki". The title was changed to "Katakiuchi Tsuzure no Nishiki" at the beginning of the 19th century. It was used for the first time in ôshibai most likely in the 11th lunar month of 1816 in Kyôto at the Kitagawa no Shibai. "Katakiuchi Tsuzure no Nishiki" was originally in 3 acts. The "Daianji Zutsumi" scene (in English "at the Daianji Temple Embankment") was in the 3rd act. Only this scene survived in the Kabuki repertoire. The houses of two samurai, Shundô Sukedayû and Sudô Rokuroemon, stand side by side in a castle town in the province of Bingo. Their gardens are separated by a hedge which can be easily passed through. 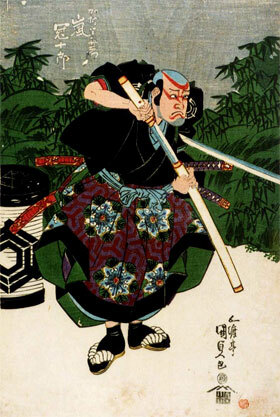 In Sukedayû's garden his third son Shundô Shinshichi practices archery. One of his arrows flies over the hedge and cuts off a chrysanthemum flower in Rokuroemon's garden, where Rokuroemon's younger sister Oshimo is playing with her maids. Oshimo, who is in love with Shinshichi, takes this opportunity to make him come to her garden through the hedge ostensibly to apologize to her for the damage to the chrysanthemum flower. Pushed by the maids, Oshimo succeeded in bringing Shinshichi into her room. Sukedayû's second son Jirôemon comes back, considerably intoxicated. He visited several of his friends' houses on the occasion of the chrysanthemum festival and drank a lot of sake. His wife Oharu takes advantage of the situation to ask for and wins his consent to a marriage between Shinshichi and Oshimo. Sukedayû's first son Suketarô comes back from a visit to Kyôto, accompanied by his father's retainers Sahei and Ihei, and reports to his mother and Jirôemon that his father (her husband) Sukedayû was murdered in Kyôto. The fact is that Sukedayû was asked by his lord to take Oteru, a dancer in Kyôto, to his castle town as he wanted to keep her as his concubine. It happened, however, that Sukedayû's next door neighbor, Sudô Rokuroemon, was in love with Oteru, so, with the help of his friend Hikosaka Jinroku, he killed Sukedayû and eloped with Oteru. 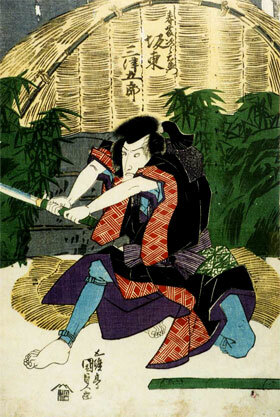 Suketarô, who is not very clever, could do nothing to prevent or avenge his father's death. Sahei attempts to kill himself for his failure to prevent his master's death but is dissuaded by Sukedayû's wife. Jirôemon and Shinshichi appear in travelling attire and propose to go with Suketarô on a trip to avenge their father's death. Their mother objects to Suketarô's participation because he is hopelessly incompetent. She draws his katana and kills her son as she does not want him to be accused of his failure to take part in the brothers' vendetta. Meanwhile, in the next house, the desperate Oshimo, whose brother was ruthless enough to kill her lover's father, commits suicide out of despair. Two years after their escape from Kyôto, Rokuroemon and Oteru are living in Kôriyama together with Jinroku. When Oteru pays a visit to the Kôriyama Hachiman Shrine, she happens to meet Denpachi and his servant Yoroku. Denpachi is a procurer who has taken Oteru from her parents with a promise to sell her for 200 ryô. As it seems impossible to get 200 ryô from Rokuroemon, Denpachi tries to return Oteru to her parents but Kamura Utaemon, in whose house Rokuroemon and Jinroku are hiding, happens to meet him and promises to pay Oteru's ransom for Rokuroemon in a few days. Denpachi, therefore, takes Oteru to his inn to keep her there until he receives the money. Utaemon is planning to raise money by selling Rokuroemon's katana to his lord. When the lord saw the katana he said he would buy it if Takaichi Buemon, another retainer, testified to the sharpness of its blade. Utaemon chances to meet Buemon and his son Shônosuke and, showing the katana to Buemon, asks him to evaluate it. Buemon says he cannot recommend it to the lord because there is no certificate for its sharpness. Utaemon, remembering that two beggars are living in a hut on the Daianji embankment, proposes to test the sharpness of the katana on them. The beggars whom Utaemon saw on the Daianji embankment are in fact, Shundô Jirôemon and Shundô Shinshichi, who, disguising themselves as beggars, are secretly looking for Rokuroemon and Jinroku, who they believe are living somewhere in Kôriyama. After his day's search for his enemies, Shinshichi returns to the hut where Jirôemon is confined due to illness. As Jirôemon complains of pains in his legs, Shinshichi goes off to buy some medicine. Utaemon, Buemon, Shônosuke and their retainers arrive and, calling Jirôemon out of the hut, tell him that he is going to be killed to test a katana. Jirôemon tells them that he cannot comply with their request because he is in fact a samurai with an important mission. Heedless of his plea, Utaemon makes his men assault Jirôemon but he throws them to right and left. Utaemon, enraged, tries to Slash Jirôemon with his katana, but Buemon restrains him and asks Jirôemon what his mission is. Jirôemon replies that he is looking for two men who murdered his father. Utaemon says that Jirôemon is telling a lie to have his life saved, but Jirôemon shows him his katana encased in his cane. Now that Jirôemon has proved himself to be a real samurai, Utaemon, Buemon and others go off without doing any harm to him. Utaemon has rightly guessed that the "beggar" is Sukedayû's son looking for Rokuroemon and Jinroku. He soon comes back with Rokuroemon and Jinroku, who attack and wound Jirôemon with their katana but they too are wounded. They go off, helped by Utaemon. Shinshichi presently comes back and hears from Jirôemon of their enemies' attack. Buemon and Shônosuke, who are sympathetic with the brothers, reappear and offer to take care of them in the Takaichi mansion to help them avenge their father's murder.